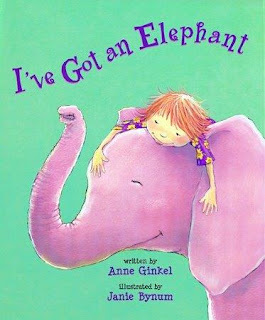 This is a fun, rhyming counting book gull of elephants in PJ's, elephants in tutus, elephants who swim and fish and... pretty much do whatever it is a kid can imagine. IT starts with an elephant who sleeps in bed. he goes out and brings home an elephant friend." Now the kid has two elephants who help with homework, but when she goes shopping with mom, the elephants get lonely and... they go out and bring home an elephant friend. Then there are four, five, six... elephants accumulate and you've got to wonder just how many elephants can one kid have? The subtitle of this book tells a great deal: "Inspired by One Family's Experience in a Japanese American Internment Camp". 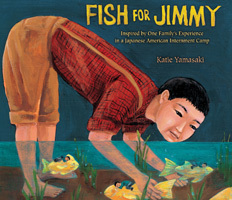 It is, notes author & muralist Katie Yamasaki, a story based on the true experiences of her great-grandfather. But it is more: a tale of courage and love. Jimmy and his big brother, Taro, live in California with their family. Then, one night in December 1941, they hear on the radio that Japan has bombed Pearl Harbor. FBI men pound on the door and take their father away, and later Jimmy, Taro and their mother are sent to live in tiny barracks surrounded by guarded fences and a desolate landscape. Jimmy stops eating. The food is weird and he wants fish. Taro does something brave and dangerous: he sneaks a pair of garden shears in his pocket and, one night, snips through the fence and goes to the river where he catches fish for Jimmy. Yamasaki discusses Japanese internment camps at the end in a note to readers, and includes a photograph of the relocation camp where her family was sent. This is a book my history-loving kids would have loved. So, the book. I couldn't resist and I had to turn one page and then another. 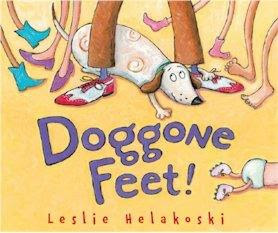 I like the silliness of a story told by a dog's under-the-table point of view. People are named by the feet they have: toes (barefoot), pink socks, blue boots. I like the way the dog makes room for new people - and their feet - in her life. She starts with a complaint: blue boots banging on the table... "I DON'T LIKE THESE FEET!" and then the realization that there's room for another pair of feet. I especially like the ending.... which involves more and more feet and is very sweet. And the bright, bold illustrations of All Those Feet! What happens when you do something good, something that helps people and something you believe in - and it goes horribly wrong? When Jess's dad ships out to Afghanistan, she wants to stay close to him. 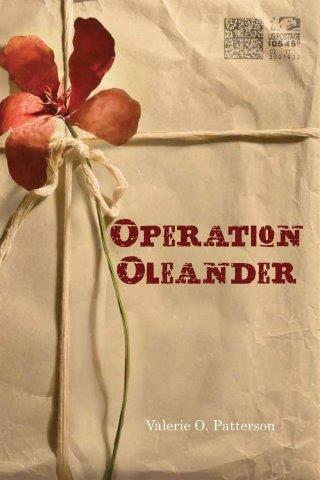 So she and her friends form "Operation Oleander", a group that collects donations of school supplies for Afghan orphans. Jess, who was adopted herself, feels a special connection with the orphans caught in a war zone. She ships the supplies overseas, and her dad's unit distributes them. Until the day the soldiers are distributing supplies to an orphanage and a bomb kills some, including her best friend's mother, and leaves her father critically wounded. The base commander orders her to shut down the operation and Jess finds herself suddenly on the wrong side of things. She wants to continue helping Afghan children orphaned by war, but how can she do it without putting soldiers like her father in danger? A good look at contemporary military family life, and ethical questions facing the folks back home. This is part of the Marvelous Middle-Grade Monday round-up. Check out more great reading here. Review copy from publisher. There's a Tiger in My Soup! Today, my big sister is in charge of the house, the lunch, and me. I hold up my book. "Will you read to me?" I ask. What's a guy to do when his sister is too busy reading her own book to sit down and read to him? Especially his favorite book - the one about tigers? 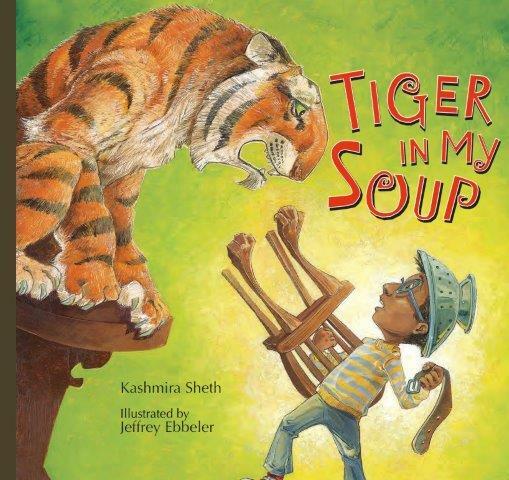 She's so engrossed in her novel that she doesn't see the tiger in the alphabet soup. She misses out on the chase scenes, the running-for-your-life scenes... indeed, all the action going on in the kitchen. I love the imagination, the roaring, and most of all the spoon-wielding kid wearing a colander on his head - so like my own kids at that age. Find wild animals in your soup. One of the games we used to play at lunchtime was finding words in alphabet soup. You can use alphabet cereal - or even scrabble tiles - but it's just so much more fun to spell out animals and eat them. Especially lions and tigers and bears (oh my). Where Tigers really live - it's not a can of soup. This National Geographic Creature Feature has maps to show where tigers live, as well as cool facts and a great video of a tiger getting a bath. Miller Sanford is a science whiz impatient for the "big fair" when he can finally unveil his secret project and "wow" everyone in town. Going to the fair has been a family event, but this year Miller's saving up his coins and lobbying to go on his own. He's even been babysitting his younger sister to show just how responsible he can be. On fair day his mother can't go and his father has to put in an extra shift at one of the volunteer booths. 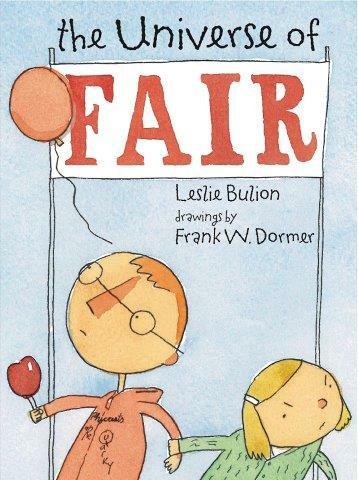 Instead of enjoying a day with his bud at the fair, Miller ends up in a string of mishaps involving a cemetery, a pie, first-grade tag-alongs as well as balloons and fair fare. What I love about this book is it's fun and quirky take on science. On the first page Miller's riding home on the school bus thinking about how, if his "molecules and atoms and electrons and quarks were put together in a different way, [he] could just as easily be an earthworm." And that his fair exhibit is on the "Theory of Everything". And that it has string theory. String Theory! his is part of the Marvelous Middle-Grade Monday round-up. Check out more great reading here. Review copy from publisher. "Momma's first day on the job, she comes home late, trudging up the stairs as if they laid that heavy stone right on her shoulders. 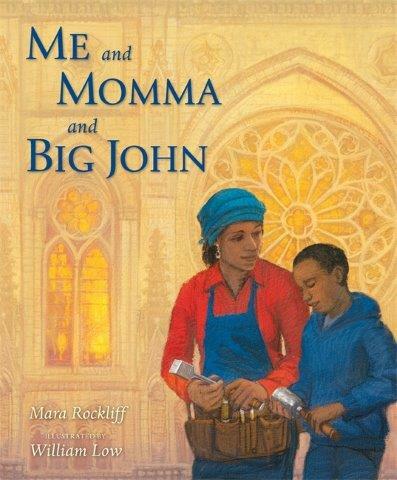 She is gray as ashes, from her headscarf to her boots..."
Momma is a stonecutter, helping build the Cathedral of Saint John the Divine in NYC. She works for weeks on a single stone, and when she and her son, John, finally visit the Cathedral, he can't see the stone. But he does see the beauty of the stained glass, hears soaring music filling the Cathedral, and gets to meet the other stone cutters. In the end he decides it's OK if other people don't know which stone is Momma's - because he'll know. It's one of the stones high above the people, touching the sky. Take a virtual "architecture tour" of St. John the Divine. You'll see images of construction, interior chapels, columns, and more. Part of the beauty of Cathedrals is the light within. Illustrator William Low captures that light and beauty in his paintings. You can, too - create tissue paper stained glass to hang in your window. There might be gargoyles on the Cathedral. You can make your own gargoyle with a paper plate and some other materials from around your house. 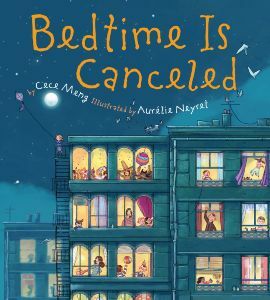 This review is part of PPBF (perfect picture book Friday), an event in which bloggers share great picture books at Susanna Leonard Hill's site. She keeps an ever-growing list of Perfect Picture Books. Review copy provided by publisher. It's 1885 and Claude Monet is on the beach painting a giant stone arch. He paints fast, to capture the light, moving from one canvas to the next as the sun moves across the sky. 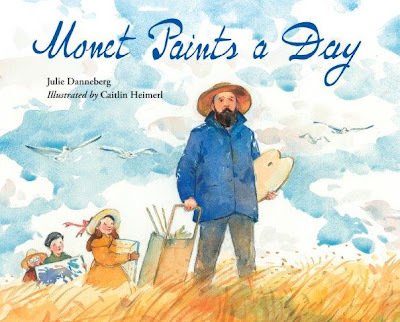 Author Julie Danneberg writes in a loose style that reflects both the impressionistic paintings of Monet and the movement of the sea: Monet ruffles his brush across canvas; water ruffles against the shore.He flutters and dabs his brush as sea foam flutters above the surf. While Monet pays great attention to the details of color and movement, he doesn't pay enough attention to the rising tide. He is caught by the rising tide, and his easels and paintings washed out to sea. While fiction, this story is based on a true incident. Danneberg scatters excerpts of Monet's notes and letters, sometimes tucking in a small text box with information about Impressionism. There's a trove of resources at the back for those who want to dig deeper into history - or just want to pick up a paintbrush. As a journalist, I get press releases all the time - releases meant to be passed on to the editor, sent to the typesetter, rushed into print. Usually we know exactly where these important announcements are coming from, and verify their veracity before they hit print. But what if a girl and her brother scribble a note that reads: Bedtime Is Canceled. ...and what if Everyone believed it? Would you take advantage of that situation to play hide and seek all night? Flashlight tag? Eat spaghetti by moonlight? This is just plain fun reading... and maybe a cautionary tale to those who read tabloids without a soupcon of skepticism.